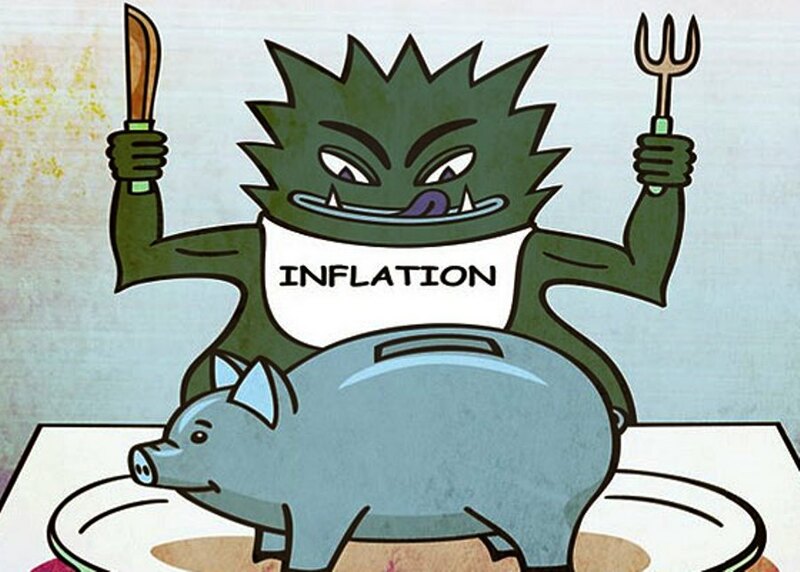 Stealthy Wealth: Do You Know Your Inflation Rate? Do You Know Your Inflation Rate? It’s a gripe people have had ever since I can remember - the official South African Inflation Number does not accurately reflect the actual inflation people experience. And I guess it is a fair point. The way the inflation number is calculated, is by keeping track of a number of items in an imaginary "inflation basket". Every month Stats SA checks the total cost of that basket and releases this number as the CPI (Consumer Price Index). The change in CPI is then pretty much what we call the inflation rate. And while Stats SA tries to put a representative mix of items in their inflation basket, there is no ways that their basket could be applicable to everyone. So we can sit here arguing what should and shouldn’t be in the South African inflation basket, and each person will do their best to punt the items they think should be included, or, we could rather just calculate our own inflation rate and check out how it compares? Using your budget, you can estimate an inflation rate for each item/category of items, and then take the weighted average of all the inflation rates to get your estimated actual inflation. And how exactly do you do this? The short answer – Excel! You can use this hot off the press spreadsheet I have created and added to the spreadsheets page. Basically what we need to do is allow the inflation rate of each individual expense in your budget to contribute to your overall inflation rate according to the size of that expense in relation to the total of your expenses. The larger the expense, the more the inflation rate of that expense will contribute to your overall inflation rate. Make sense? The cool kids call this a weighted average. 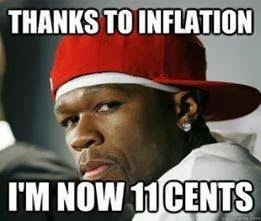 Inflation affects everybody – even Fifty! The spreadsheet is pretty straightforward. The first column is for the description of your expenses. If something is not applicable, make it 0 or just delete the entry. If there are extra expenses, just add them onto the bottom. The second column is for the Rand amount of the expense – no rocket science here. In the last column, enter the estimated inflation rate for the expense. This is of course not an exact science, but I am sure you can come up with some good enough estimates – more detail on that in the next section. Below are some considerations which may help you pick the inflation rates for various items on your expense list. If you are renting, you can just use the annual increase clause in your rental contract. If you bought and are paying off a bond, you actually get a nice inflation side effect. Since your bond payment remains constant (let’s ignore interest rate changes for the moment) this is a 0 inflation item. And since your bond payment probably makes up a large percentage of your monthly expenses (around 30% in our case) it actually has a significant impact on your overall inflation rate. Of course the other household related expenses like rates, levies, insurance and maintenance will have some inflation associated with them - you can use previous annual increases to guide you in estimating these. This one is definitely more than CPI. I did some scratching around on this in a previous post so you can maybe get some pointers from there. Personally I use a rate of 9% for my planning. Again this one is considerably higher than CPI. You can base your estimate on previous annual increases (if you stayed on the same plan) or do some Googling, there are plenty articles around medical inflation. Personally I use a rate of 9% (based on my past experience). I think it is important to keep this important distinction in mind. If, for example, you had a child and now need a bigger place and better medical aid, you can’t say that is due to inflation. Because your rent is now 50% more, doesn’t mean your housing expense inflation is 50%. Likewise if you decided to go from a 20Gb internet contract to an uncapped, unshaped package at double the cost – it is not 100% inflation, it is lifestyle creep. Under 5%. Not bad, and compares pretty favourably to the 2017 average year on year inflation rate of 5.3% (but is a little higher than the latest CPI reading of 4.6%). The low rate is mostly due to the 0% inflation rate I used for our Bond repayments (which is around 30% of our expenses). What also helps is that we have no Education expenses at the moment, because my wife is a stay at home mom. This will change in the next few years and kick our rate up a little. Hmmmm, that's considerably higher than current and long term average CPI. It is a little concerning. The main culprits are medical and education, which I estimate will make up over 1/3 of our total expenses in retirement. I do realise that Junior won’t be in school forever though, and so I checked what removing the schooling expense would do to the inflation rate – 7.15%. That’s a little better, but still above the long term CPI average. And although the extra money that get's freed up once Junior's education is done will certainly go some way to counteract the higher inflation, this is definitely something I will need keep an eye on.